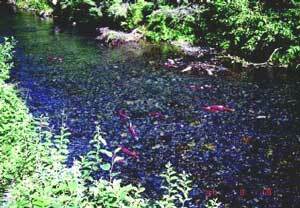 The Department works to protect and restore fish habitat through regional cost share projects located in the Matanuska-Susitna basin, Kenai Peninsula and Fairbanks areas. In these programs, staff work cooperatively with private land owners and public land managers to complete habitat restoration and protection projects. The Department’s cost share projects began on the Kenai Peninsula in 1995, and have gradually expanded since that time. Hundreds of shoreline rehabilitation and protection projects have been completed on miles of shoreline, providing benefits to habitat, fish, wildlife and human residents of these watersheds.